June, Monday 20, 1864 Near Kenesaw Mountain Ga we had to advance our lines last evning up to the enamy main works and lay here untill 2 oclock P.M. when we were orderd to the fro[nt] a distatant of 1 1/2 miles, the rebles did not fall back any farther than to the side of the Kenesaw mountain we are in the advance here. it rain to day quite hard. 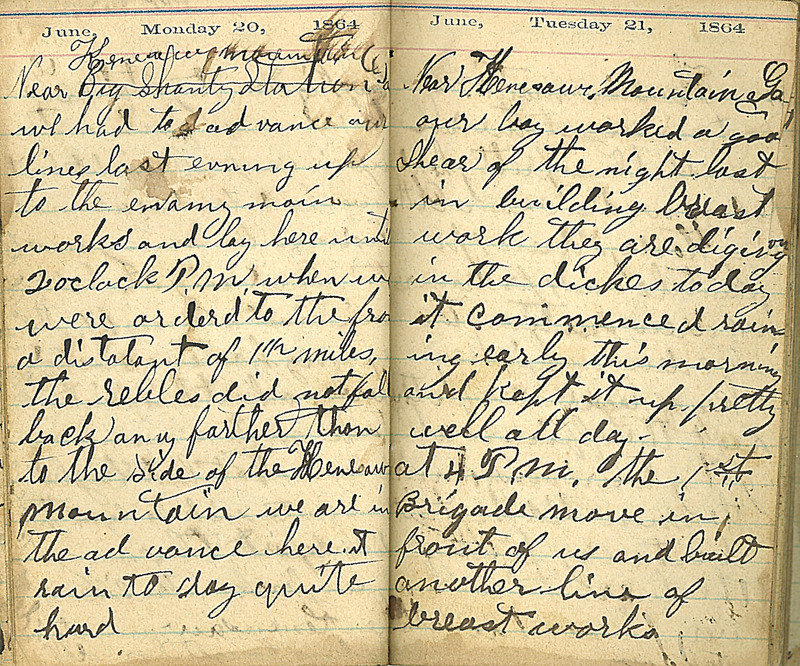 June, Tuesday 21, 1864 Near Kenesaw Mountain Ga our boy worked a good Shear of the night last night in building breast work they are diging ou[t] in the diches to day it Commenced raining early this morning and kept it up, pretty well all day. at 4 P.M. the 1st,,Brigade move in front of us and built another line of breast works.